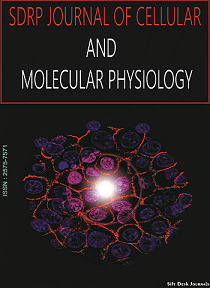 SDRP Journal of Cellular and Molecular Physiology is an open access journal accessible for free on the internet. Publishes original research articles as well as review articles in all areas of Cellular and Molecular Physiology. Cellular and Molecular Physiology addresses the process by which molecules travel across membranes targeting the following levels: Cellular, molecular and systemic levels with emphasis on active and passive transport. Cellular and Molecular Physiology give an elevated level of emphasis to understanding and forming the foundation for creating the intimate world of structuring the biochemical, cellular and molecular levels of development. A look into the physiological world of amino acids, lipids, proteins and the function of each. As this cellular and molecular community evolves, one finds it necessary to study intensely the conduct of thecell and the molecule world. Example: What signals a cell to respond to an external environment, what causes a molecule not to maintain its consistency in a stable environment. Cellular and Molecular Physiology has a direct impact on how proteins according to their membranes qualitatively perform with their ability to initiate and create the necessary activities responsible for jump starting electrical activities within the membrane and the discipline with focus on understanding the processes that transfer molecules across membranes at the cellular, molecular, biophysical, and organismal levels. Individuals are invited to learn about the different classes of molecular machines that mediate membrane transport, as well as generate electrical activities according to action and resting potential. Cellular and Molecular Physiology gives a deep dive into the biochemical derivatives that are borne within the cellular and molecular population. Understanding cellular functions require an in depth focus starting within the nucleus of a cell and advancing to primary and secondary locations with emphasis on the specific categories of cellular and Molecular Physiology with embedded concepts and applications of microscopy at different resolutions ranging from low to high, in order to develop an understanding of cellular and molecular arrangements, the story is better communicated in terms of conceptualization of the processes. The questions that we answer about cellular and molecular physiology lie within the elements, the cells and the molecules that give birth to understanding the total dichotomy of the human body. There is no one technique, that gives a terminal answer to when, where, why and how cells and molecules communicate. Just at the moment, when we think mastery of cellular and molecular activities have been fully understood, there appears, in many cases, an altering of how communications interact, oppose, or no adherence to its immediate opponents. Cellular and Molecular Physiology enhances the partial understanding of a cell or molecule, so what is the task assigned to the community of physiology. The etiology of a cell, the rhythm of a cell and the aggregation of the molecular population are venues in which to express the mechanisms that accumulate, antagonize, impose or challenges a physiological environment. As we look into the chemistry of it all, one has to clearly understand how the elements play into the cellular and molecular story. Example: What role does calcium, carbon, iron, oxygen, nitrogen, phosphorus and many other elements play in terms of physiological attributes in the cellular and molecular community. The submitted articles are peer-reviewed within approximately 15 days of submission and the accepted articles are published on the internet immediately upon receiving the final versions. The scope encompasses all subjects related to genetic, epigenetic, biochemical, and molecular aspects of endocrine research and cell regulation.